BANGKOK, Thailand. KidZania Journal. August 29, 2012. (English) by Cammie Dunaway. -Out of KidZania is a program initiated by KidZania Japan to provide children even more real world educational experiences like visits to marketing partners manufacturing facilities. Recently Out of KidZania sponsored their first trip outside of Japan with a visit to a Nichirei production facility in Thailand. 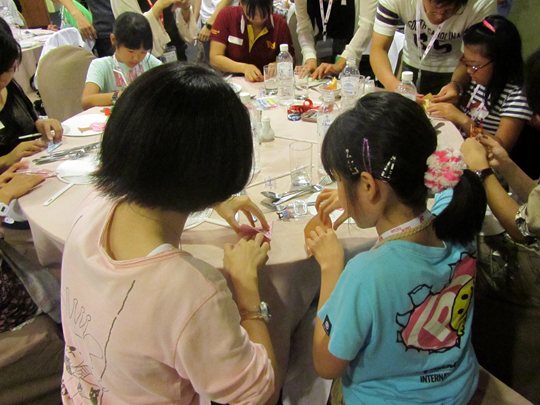 Twenty children and 6 Zupervisors traveled with Yosuke Sekiguchi, head of Marketing and Ami Kamino from the Industry Partners team on the three-day adventure. Mr. Okanda and Ms. Watanabe from Nichirei and media representatives from Kobayashi and Asahi newspapers also participated in the trip. The children ranged in age from 11 to 14 years old and were selected from a number of applicants based on an essay describing their reasons for wanting to participate. The group was also balanced for gender and age. After arriving from Tokyo, the group had dinner with staff from KidZania Bangkok and 10 Thai children. 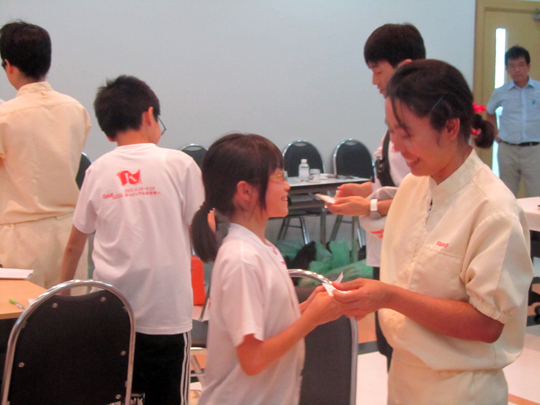 It was apparent that the kids had a great time getting to know one another as the Japanese children showed the Thai kids how to make fans with origami swans and cherry blossoms. The next day the Japanese children learned more about the culture of Thailand by visiting a coconut farm, a floating market, an elephant show and a Tesco supermarket. The kids, many of whom had never traveled out of Japan, really loved seeing the similarities and differences in how people live and work in Thailand. The highlight of the trip was a full day journey to the Nichirei poultry plant about 3 hours out of Bangkok. The plant makes the Honwafu seasoned chicken that is a favorite in the Japanese market. Senior executives from Nichirei explained the company’s business and their focus on quality and safety. The children were grouped in four teams and allowed to participate in activities in R&D, packaging and processing. It was particularly exciting because no outsider had ever been granted this type of access to the plant. After their hands on experiences, the children interviewed plant supervisors, wrote reports and did presentations about what they had learned. Everyone was very impressed with the children’s keen observations. Participants to this Out of KidZania trip to Thailand were very excited to discover amazing things in Bangkok!